Testing life hacks to open wine, to erase permanent marker and get paint off your hands! Smart Shopper Chelsey Davis tests out some life hacks and lets your know if they are Bull or No Bull. From time to time, your Smart Shopper team takes a break from testing out products to test out procedures instead! Let's see if these three life hacks really work! If you don't have a wine bottle opener, don't let it put a cork in your plans! Can a key open it? I say, WINE not! You're supposed to be able to stick a key into the cork, twist it and pop the bottle open! But, our first key just made a hole when we twisted, and came right out with the cork still wedged in tight. We tried a second key that was longer and had more teeth, but it still didn't open, and it ended up bending the key significantly. 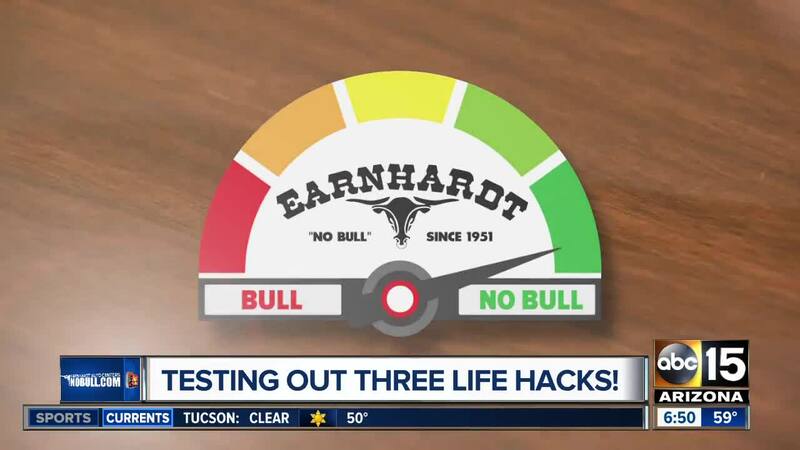 Where does this hack rank on our 'Bull or No Bull Meter'? I'm going with... BULL! Do you ever get carried away with an art project and get paint all over your hands? Check out this hack! Take a cotton ball and canola oil, and it should come right off. When we tried it, the paint did not come off. Technically, the hack called for vegetable oil, so we tried that too! After lots of scrubbing, it barely made a dent. The paint was still there. Good 'ole soap and water did the trick though and made my hands squeaky clean! Originally, I stated that OIL gave this life hack a no-go, but after researching more, it appears that only oil-based paints should be able to be removed using vegetable oil. The paint we used was not oil-based. So, if you have any oil-based paint, let us know if this hack works for you! Have you ever had a bright idea turn into a dark one? A permanent line of marker on the table, that is! Well, a cotton ball and nail polish remover are supposed to erase Sharpie. With ease, and to our surprise, this one is... NO BULL! It only took a couple swipes of the cotton ball, and it was as if the permanent marker was never there. Word of caution: be careful though. The color of the wood changed slightly in the section we wiped with the cotton ball. We have not tested to see if nail polish remover can alter the state of the wood, the stain, or even the finish. So, keep that in mind! On March 21, we are going to try one more life hack on our Smart Shopper 15 Facebook page . We will cut a lemon in half, rub a cotton swab on the inside of the lemon, and see if it can erase highlighter. What life hacks do you want us to try? What products do you want us to test? Email me , and let me know if you want to be part of the testing process!